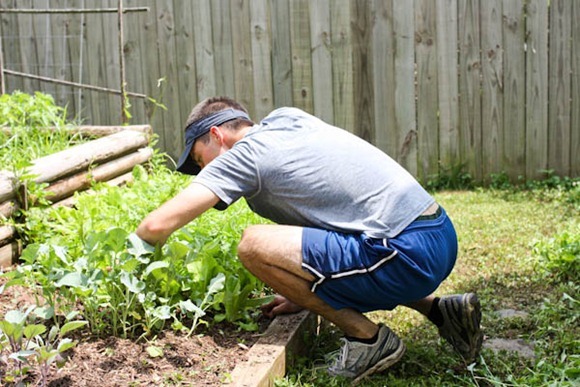 Matt and I participated in a 3-hour, exhausting backyard bootcamp!! Don’t ask me why my tank top is tucked in! How embarrassing. It must have gotten stuck. Also, notice the blooper here? Despite SPF 85, I now have a sick tank top & sports bra tan line on my back. 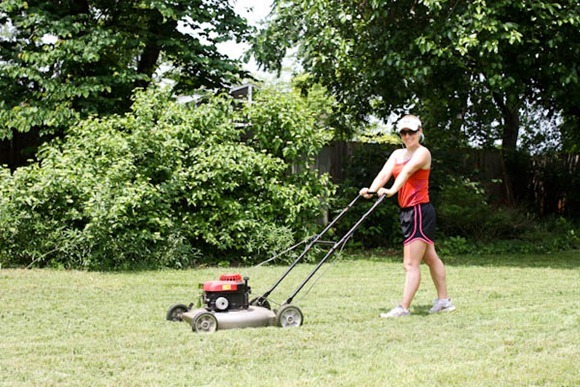 Mowing was HARD because our grass was super long. I also weeded, raked, pruned, and more. My delicate hands have the blisters to show for it! We were long overdue for a strawberry patch harvest! When we finally came inside, I cracked open a cold one. 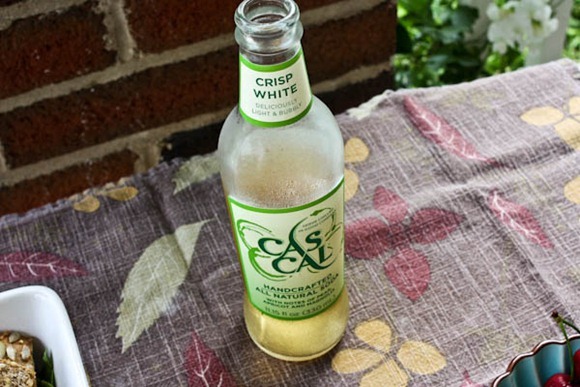 This is leftover from the shipment of Cascal Foodbuzz sent out – I love these sodas! I generally don’t like to drink my calories (unless they are alcoholic calories 😉 ) so I don’t drink a lot of natural soda or juice. But at 70 calories a bottle, I think the great taste of these are worth it. Same with Kombocha. I like them both a lot. They’re great to keep in the fridge for a non-alcoholic fizz. 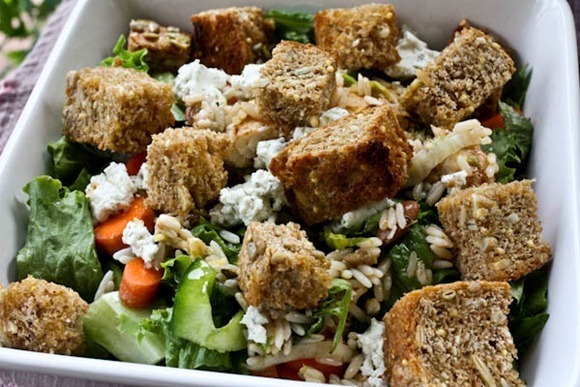 We made big salads topped with last night’s leftover burrito bowl fish and big cubes of Dakota croutons! Matt take the Dakota and cubes it, then tosses it in olive oil, salt and pepper in a bowl and broils them for about 8 minutes. Perfection!! Cherries!!! I found these local this weekend at Feast! and had to get some. I love cherries! 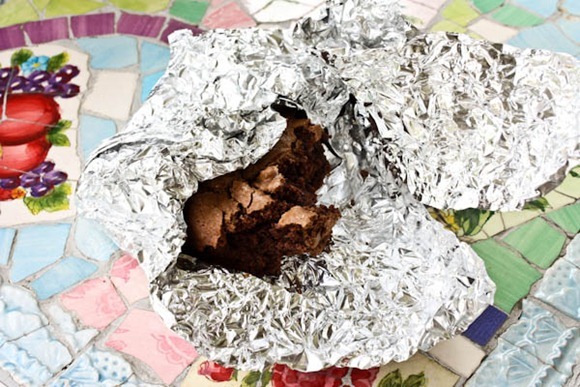 After lunch, Matt and I attacked Karen’s brownie. This guy was SO doughy on the inside and perfectly crispy on the outside. My kinda brownie! I had hoped to do some cooking today (almond butter!) but I am pooped for the time being. We have a few more honeydews dos to tackle and a fun dinner simmering in my brain! Such pretty strawberries! I wish I had a yard to grow some. The possibilties with those strawberries are endless! I think it’s a yard week kind of weekend. We’ve been attacking ours all day too. 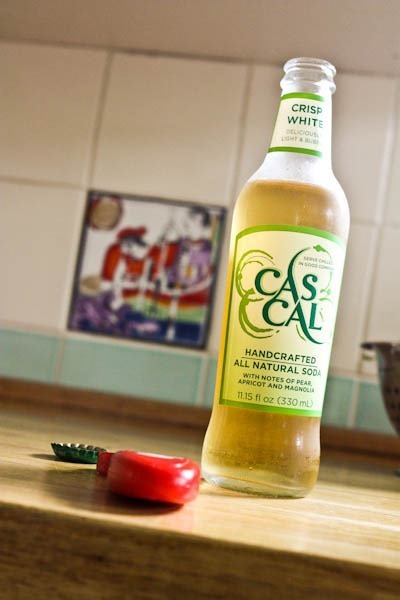 I just recently tried Cas Cal fermented soda, and I loved it! The little bite from fermentation was perfect. Sounds like the perfect weekend! I’m headed out to do some yard work now too! Mmmm…local strawberries and cherries….so jealous! Not quite yet here…but strawberries within a few weeks! Love the ultimate productivity afternoon outdoors. Woo hoo for that! 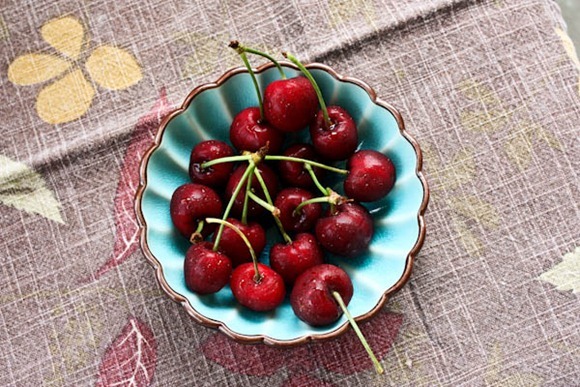 Love the cherries/placemat overhead shot. So pretty! I need to have Faith help me get started! I also brew in an oak barrel so my ‘booch is “oaked” sort of like a nice chardonnay would be. 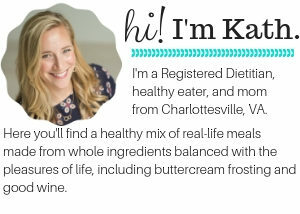 I then flavor in the bottling process rather than in the brewing process so I can customize the flavors ranging from vanilla stevia drops to pureed mango incorporated..whatever I am feeling like. I wonder if we could put it in a beer keg..
I’m not letting those bacteria get near the beer! war wounds from working in the garden are the best! I am learning to love blisters on my hands and dirt in my nails. It’s all for the veggies! Go you for getting things done! Pretty soon you’re going to convince me to go buy some GH bread! 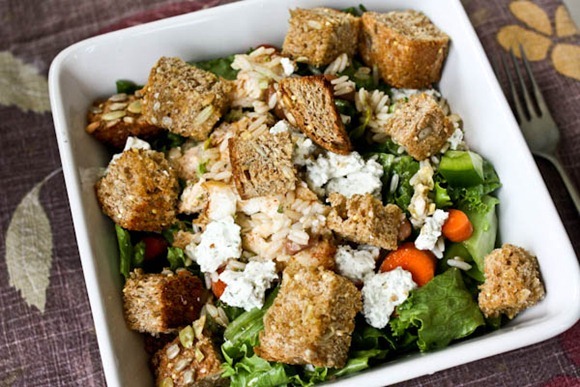 Turning it into a crouton sounds amazing. Just catching up on the last few days postings and thought to let you know about the pure wool mattress toppers we have in Australia, Warm in Winter, Cool in Summer. I machine wash mine on wool cycle with wool wash a couple of times a year. You can’t wash the feather tops(too big) and dry cleaning is very expensive also the foam ones have a slight smell…..so I chose wool. It is like sleeping on a fluffy cloud, sooooo comfortable. If you can’t get them retail where you are, you may find them online, good luck with your choice. 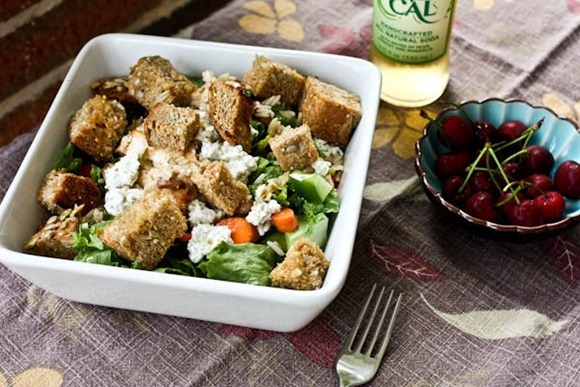 Homemade croutons are the best — especially since you can make them as big as you want! Hahahah. So something Matt would do! Blooper- u are going the wrong way! Close, but that’s not it! This reminds me – I gotta visit the blueberry hill! 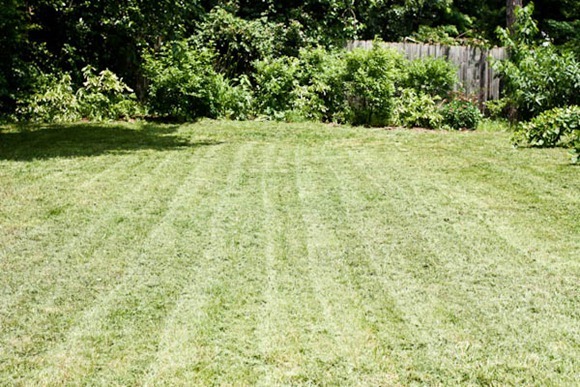 wow – great job on the garden!!!! 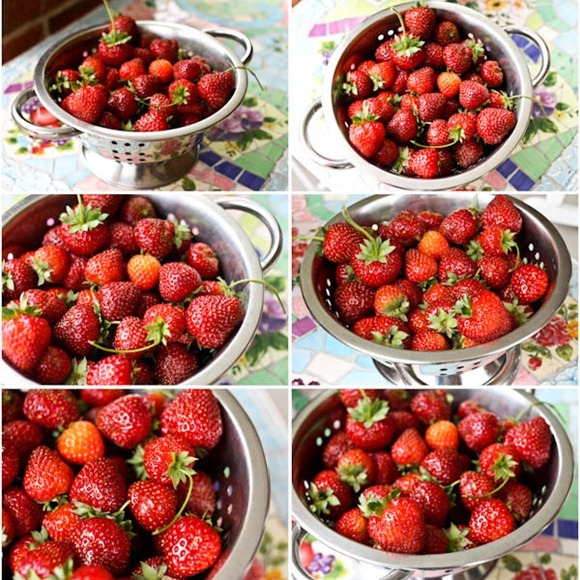 Beautiful strawberry harvest!! I hope I can grow some just as nice one day soon. Yum! 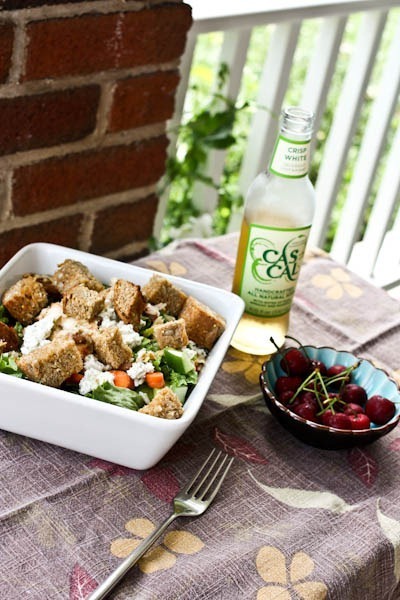 Homemade croutons are the best! I need to make some again! I’m stumped about the blooper. i am insanely jealous of your strawberry patch!!!! O and not to mention, those strawberries, JEALOUS! Yard work is definitely hard work!! 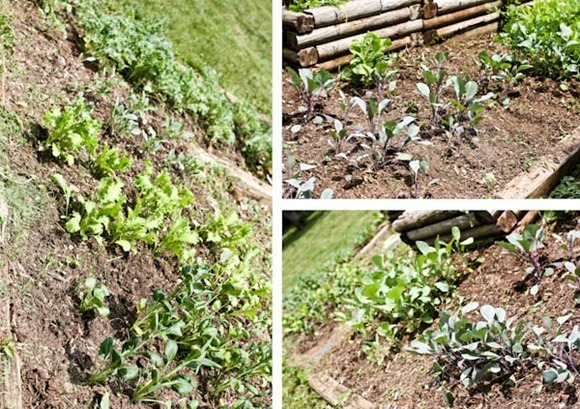 I need to work on my garden (or..start one) but am way too lazy to put in the effort. Plus it’s so dang hot already! So majoy props to you two for getting it done! So pretty! I hope we get that many from our plants! We have our first big one turning pink today. See? Haha – hope she brightens up for you! Thanks. 😀 We’re very proud. I’ve heard the first year harvest is kinda small compared to subsequent years. Yours have been there a while, right? Wow, it really looks like you had a super busy day! i’m so happy it’s cherry season again! What is the soda made of? Does it have some kind of benefits or something like Kombucha…although I don’t know what those benefits are either!! Your legs look like they got fried in the sun from the knee down. Do they hurt, or aren’t they burnt and I am seeing things? The Cascal looks very refreshing! Yardwork! 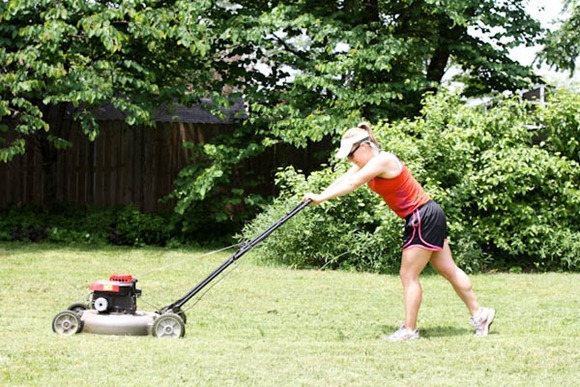 Since moving out of my parents’ house, I haven’t really had any yard work to do because we live in a condo.. and (I will probably kick myself for saying this at some point) .. but I miss it! 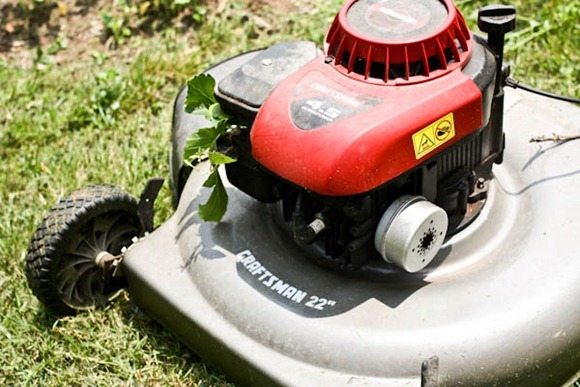 I used to be the lawnmower at the house.. and while it can be annoying, it is also a great reason to get out side and move around! I saw cherries at the store today. I wanted to buy them so bad. They were organic and 10.39 a pound. I nearly fell over! I can’t wait till the price drops and I can enjoy some. Your’s looked delicious! 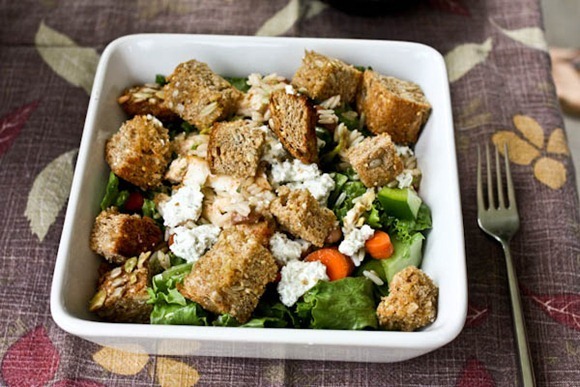 Love the great big crunchy croutons! Wow that brownie looks delicious…although the strawberries & cherries are equally appealing! YUM! You crack me up. What a poser. Hope you have a great Memorial Day. 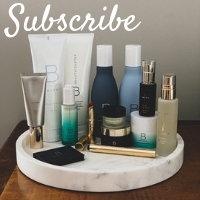 I like the spray kinds – I think mine is Banana Boat? I love hand crafted sodas, but I’ve gone more for the hand crafted beers since I’ve finally acquired the taste after 34 years. I’ll take mowing over weeding any day!